The rains overnight left the fields soggy so no flight this morning. All in all, a successful event for everyone involved. Final Standings have Askren Air in first, Rick Cusick in second, and Troutman Thunder in third. National Director Maury Sullivan had a nice flight.......enough said. The weather cooperated nicely tonight for a flight and the glow in Coshocton, OH. Jim Birk called a MJDG and told the pilots to launch quickly to keep the steering. The "A" team whined to the event director that they couldn't possibly make either target before he launched and made a first place drop. Guess next time Sean will have to have a bit more faith in Mr. Birk or else he will face a serious penalty for second guessing the task callng and will find himself no longer flying around our area. Twelve pilots scored. Most of rest had the opportunity to score but they got greedy on the first target and didn't drop in the hope they would be closer on the second. The hills and valleys with the drainage winds worked some favors for a number of the pilots. The landowners were great including the dairy farm where we had the first target. They brought the cows down off the hills to give the pilots more opportunities for landing spots. The "A" Team redeemed themself by standing the State Farm Insurance balloon up for the glow at 8:30. Unfortunately, several other balloons thought that looked like a good idea and wore their crews out before it got dark. Pizzas and cash were distributed the balloons that glowed and the crowd got lots of great photo opportunities. Update - They've had to cancel both flights so far in Coshocton due to rain and thunderstorms. More of the same for the rest of the weekend. 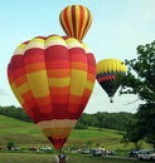 The small, river valley town of Coshocton, OH will play host this weekend to 25 competitive hot air balloon teams. 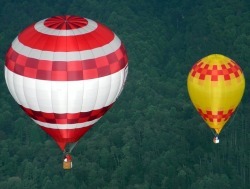 Started by ballooning legend Bob Zanella many years ago, the event has always had a focus on competition. In fact several of the participating pilots started out their ballooning career as observers in Coshocton. The event has long been a draw for Ohio balloonists, but recently has started to attract pilots from abroad with Michigan, Kentucky, and South Carolina all represented in the field this year. The highlight of this weekend for locals and balloonists alike will be a performance by Phil Dirt and the Dozers while balloons glow behind the stage. The flying area in Coshocton consists of rolling hills creating valley winds that vary from one to the nest. Jim Birk will be calling the tasks again the weekend and will no doubt require pilots to fly into several different valleys to achieve results. A good crew relaying low level valley winds will be vital to success. in the field you'll find Sean "Askren Air", David "Troutman Thunder", and Nationals Director Maury Sullivan who will take a step down from management this weekend to compete. Maury won his last competition in Statesville, NC last October. Competition starts Saturday Morning. Follow live on Twitter and recaps on the website.